This issue consists of two parts. Both parts are connected with the upcoming review competition of graduation projects, which will be held in Krasnoyarsk in the second half of September. Konstantin Kiyanenko has sent us a map of Russia with architecture schools densely marked in the European part, in the west, and with a decreasing number of such schools further to the east. It is in direct ratio to the population. There are so few (and fewer and fewer) of us… The more crucial it is that Krasnoyarsk, the biggest city of Eastern Siberia, was chosen to conduct the review competition. This issue contains a catalogue of the annual East-Siberian Zodchestvo Festival and the winning works from Krasnoyarsk presented in detail. 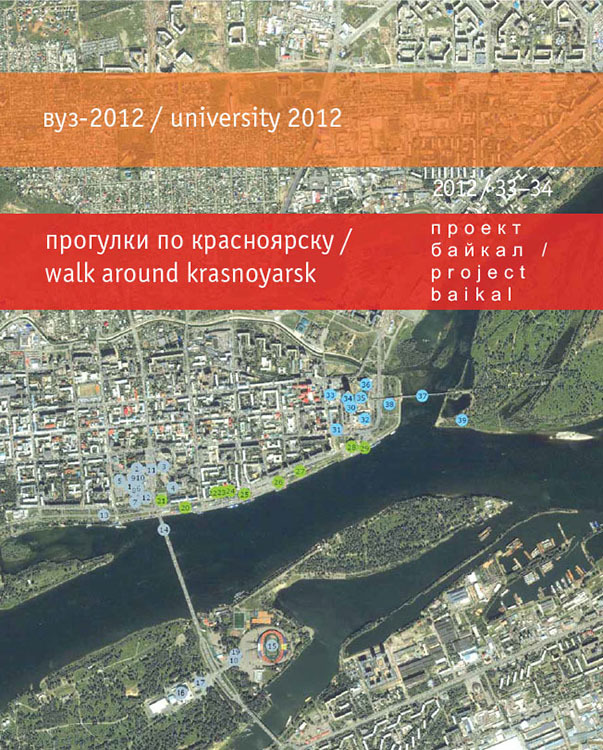 The projects for the Ergaki by Alexei Myakota will show us the mountains, which are also visible in the city. Together with the guests, we will have a walk around the two central squares in Krasnoyarsk, along the embankment that connects those squares, and on the islands. Olga Smirnova, a graduate of Leningrad Engineering Construction Institute and a landscape architect, who has been working in Krasnoyarsk for a long time, expresses her love to the city in her frank and sincere talk with her colleagues. The city’s beautiful things are made by those who graduated from Russian, Soviet and again Russian Universities. And the mistakes are also made by us. GRIGORYEVA, Elena. university 2012 / krasnoyarsk. project baikal, Russian Federation, n. 33-34, p. 1-1, sep. 2012. ISSN 2309-3072. Available at: <http://www.projectbaikal.com/index.php/pb/article/view/38>. Date accessed: 18 apr. 2019. doi: https://doi.org/10.7480/projectbaikal.33-34.38.